BBC Connected Studio: Get involved in shaping digital content at the Beeb | O'Really? 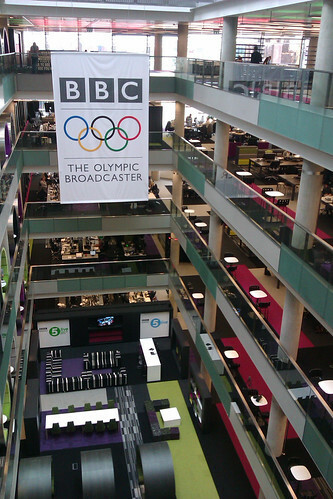 The BBC is currently seeking external partners for collaborative innovation around BBC Online. This is happening through a series of events called BBC Connected Studio. It’s open to small, medium and micro businesses, individuals and digital agencies from the creative sector who want to work with the BBC developing new functions, features or formats for online audiences. The first studio was held in Manchester last Friday focusing on Home Page, Search and Navigation (HPSN), a part of the Beeb that gets around 9 million (and up to 40 million) unique visitors every week from the UK alone. International visitors to this page get sent to bbc.com which is completely separate. Here are some rough notes on the event from a non-BBC outsiders perspective. Then you pitch an idea in ~2 minutes (like a much friendlier version of Dragons’ Den) to an assembled audience of about 80-ish people collected on the day. For the event last Friday, the studio was kicked off by introductions from Ralph Rivera and Adrian Woolard, James Thornett and Clare Hudson. During the day, there was expert advice available, formally at Speakers’ Corner and informally via conversation. This covered a wide range of topics including Simon Williams on audiences, Tim Fiennes on market analysis, Tom Broughton on homepage technology, Steve Gibbons on user experience and Phil Poole on personalisation. Following this there was time to work on concepts and plan presentations, including a very useful audience feedback session with some real users of the BBC home page. At the end of the day there were just over 20 open public pitches and 9 closed private pitches (those with sensitive intellectual property rights). I teamed up with Nick Drummond (of ATilla the AT-AT pet fame) to pitch an idea called Show Me More – providing links to BBC content directly on the home page (bbc.co.uk). The event went well, especially since this was the first one of the series. The audience feedback sessions and speakers corner were well organised and well attended. Whatever the outcome, this was a good opportunity to bid for work, see what goes on at the BBC and meet some of the people behind the BBC online. There was lots of advice available on how to work up a pitch, the audience was friendly and respectful. It was enlightening to watch other people’s presentations. The fifth floor of Quay house at MediaCityUK (pictured above) is an ideal venue for this kind of event with lots of different sized spaces for collaborating, thinking, eating, drinking and enjoying the fine views of Manchester from an elevated perspective. I think there might be a BBC SPARQL endpoint somewhere (there certainly used to be), which is an API of sorts but can’t find the exact location at the time of posting this. All in all, BBC Connected Studio was informative and fun, thanks to Adrian Woolard and everyone at the BBC for your excellent hospitality. If you’re interested in taking part, it’s well worth joining in. If you’d liked to get involved in BBC Connected, there are various events scheduled in 2012 on different products at the Beeb including: Weather & Travel, CBeebies, UX&D, CBBC, Sport, TV / iPlayer, News, Knowledge & Learning, Radio & Music. For more info subscribe to the BBC Internet blog, follow tweets @BBC_Connected or visit BBC Connected Studio.